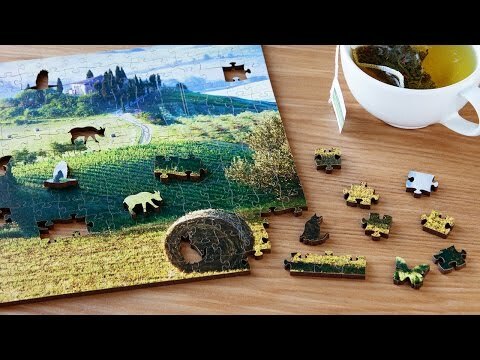 This unconventional, heirloom-quality wooden puzzle will be entertaining your family for years to come. Handcrafted in the USA from premium Birchwood—this isn’t just an ordinary puzzle. First, the wooden pieces are made with a Giclee printing process that has a glossy, high-resolution finish that’ll last for generations. 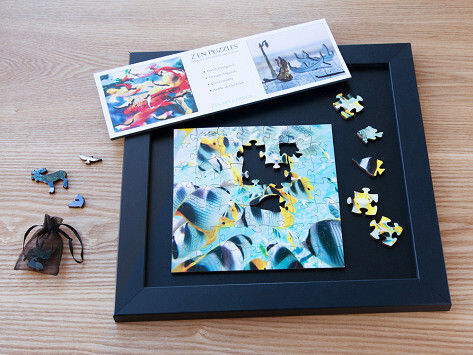 Each piece feels well crafted and durable—unlike the cardboard puzzles you may be used to. And besides the standard-shaped jigsaw pieces, there are more playful shapes that are surprising and fun to look at—anything from dogs to silhouettes of dancers. To document your puzzle-solving pursuits, each Zen Design puzzle comes with a small booklet to log who has completed the puzzle over the years. Enjoy this new, fun family tradition at a summer house or on holidays. Maker Will Carswell liked the simplicity and pace of the jigsaw-ing experience. Zen Art & Design is meant to help relax and entertain you in the present moment, and offer a different type of escape.